In September of 2017, I was in Harare for the 2nd International Conference on African Culture, hosted at the National Gallery of Zimbabwe. It was here that I first encountered the word, curatoriality. George Shire —a London-based, Zimbabwean, independent radical scholar and cultural critic— made mention of the term in response to a colleague’s presentation on curation. The presentation he referenced posited that one of the primary functions of curation is storytelling. To paraphrase, Shire stated that we need to take into consideration the notion of curatoriality: the power inherent to the curator’s function as caretaker, conservator, scholar, and/or facilitator of art works; and the ways in which that power is executed, its impact, and its meaning. Admittedly, I found no fault with Shire’s offering then and I find no fault now. When I have had the opportunity to observe the curatorial process in close proximity, or when I sit and speak with my artist colleagues —even when the final product is ad opus magnificus— it is inevitable that I either witness or am informed about at least one, if not several instances of, misuse of power. The positive stories are, regrettably, fewer. To be clear, artists do not expect perfection. They do, based on feedback I have received, expect professionalism and to be treated like a human, not a product. Unfortunately, the misuses of curatorial power abound. These often manifest when curators treat living artists as if they are deceased and canonized. For example, a curator might promise to fund certain aspects of an exhibition, and after contracts have been signed attempts to renege on that promise more than halfway through the planning stages, thus derailing the entire process. Or this may constitute a promise to include a series of works from the outset of the planning and in the weeks leading up to the opening, state it is impossible to include the initial agreed-upon works. Of the most audacious examples occurred just a few years back. I attended an opening reception where I both heard and read, almost verbatim, much of the same language from an exhibition that had only closed less than a year before in another institution. So much for new scholarship! A more recent, but equally as foolhardy situation, revealed a curator who knew nothing of the artist's oeuvre, nor was there any attempt to become at least proficient during the course of the planning process. This curator made a series of decisions independent from any artist input, which adversely affected the installation process up to the final hour. In several instances, the curator made intentional decisions without the consultation of the artists, knowing when the artists found out it would be too late to change course. While these misuses seem innocuous, or in fact may be standard museum practice, these actions constitute an affront to artists and are exemplary of heavy-handed power-wielding over a class of individuals without whom none of us would be employed. To be frank, it goes against what should be central to curatorial practice: caretaking. This is the recidivist, abusive aspect of curatoriality in action and it is performed, repeatedly, because it is a foolproof method of holding power. This notion is not at all shocking when contextualized alongside the histories of many museums in the world populated by collections of objects that were never meant to inhabit museums. What is shocking is the dearth of conversation, particularly within the contemporary art world, on how curatoriality can be additive. To note the remarkably positive experiences I have observed, these are instances where curators use their power to create and hold space for artists, make subtle nuances in the work visible, and bring forward the artist’s conceptual underpinning in a way that is accessible to a broad range of viewers. While yes, much of this work is connected to the curator’s ability to create a compelling narrative, it is foremost (in my opinion) about the curator using their power in an additive manner. In this scenario, the power brokering is not about control. It is about creating the optimal environment for the story to emerge, where the works can be in conversation with each other and the space they are in. This manner of curating creates an experience that engages an audience with maximum impact. Over the course of this residency and thinking about Mike Wagner’s work, curation has taken on a new meaning. Bridge Productions gallery owner, Sharon Arnold, offered me this residency as an opportunity to think about my positionality as an essayist and curator, write about many of the things that impact this position, and launch an exhibition. I offered Mike Wagner an opportunity show to new paintings. While Mike made works, I brainstormed on the writing that could match the heft I knew he would bring to this exhibition. Curation, in this iteration, has been synonymous with facilitator and advocate. I have worked to make space, not take up space; I sought, to quote a dear friend, to be generative, not subtractive. Most importantly, it was my personal requirement that this experience demonstrates a respect and admiration for the maker and the viscerally alluring work he created. My efforts are not a panacea; however, I believe they are an alternative way of positioning oneself as a curator that counters the all too frequent episodes of reductive curatoriality that many artists experience. 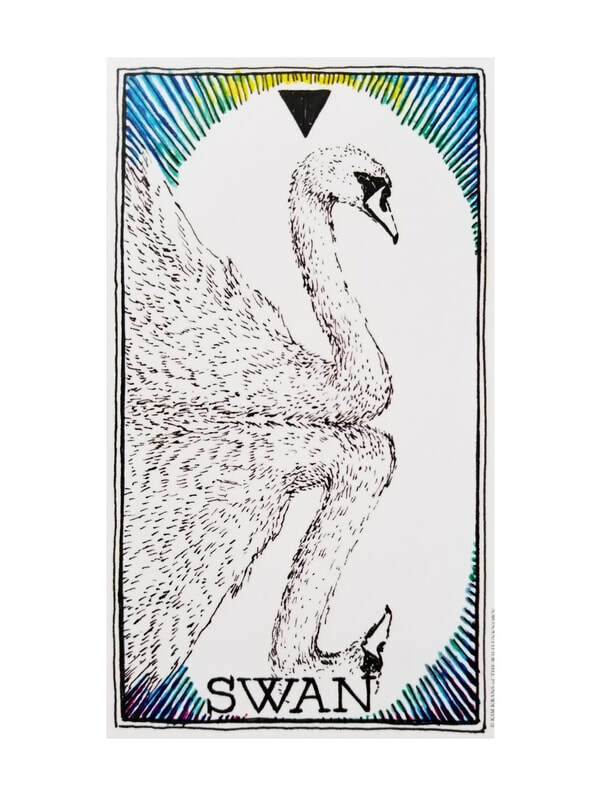 SWAN, from the Wild Unknown Animal Spirit Deck, written and illustrated by Kim Krans. The swan in this case represents heightened sensitivity, creativity, and elegance in power through quiet, scholarly acts of observation, reflection, and articulation. This essay is part two of a three-part series of writing produced during Negarra A. Kudumu's curatorial residency at Bridge Productions in which she discusses the key issues in her practice such as the education and curation as spectrum not a binary, curatoriality, and condition versus methodology particularly where African and African Diasporic cultural politics are concerned. To highlight and bring to bear these thought experiments, Negarra has curated From Fool to World, featuring new and existing works by the prolific multidisciplinary artist Mike Wagner.